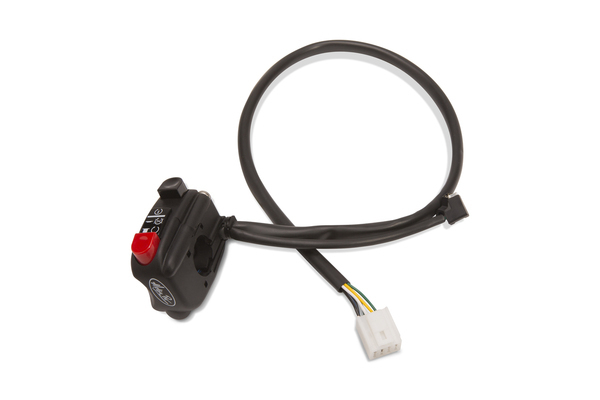 The Rev2™ throttle has several different size reels that will change how much twist is necessary for the throttle to completely open the carbs or throttle bodies on a motorcycle. The larger the reel is, the shorter the twist. 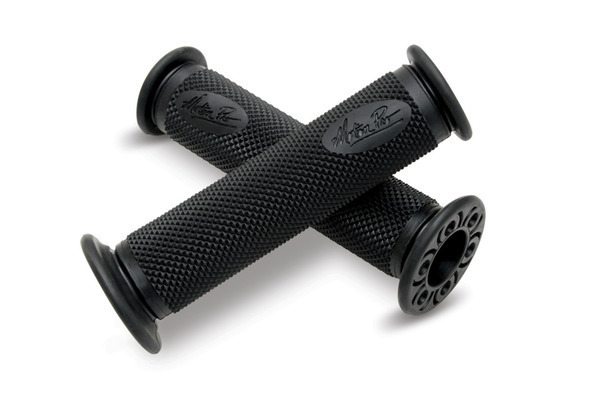 Each reel size will shorten the twist by about 10 degrees. 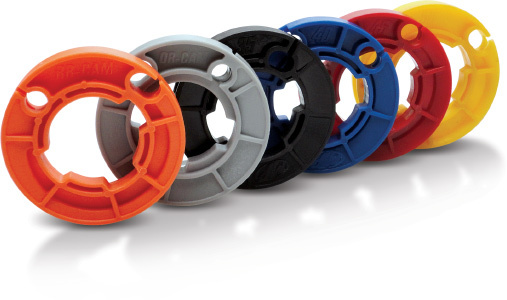 If your stock throttle has a 40mm reel and stock twist is 90 degrees (1/4 turn), the 45mm reel will reduce the twist to 80 degrees and the 50mm reel will reduce it to 70 degrees. The 35mm reel will increase the throttle twist to approximately 100 degrees. This is just an example; every model of motorcycle is different. 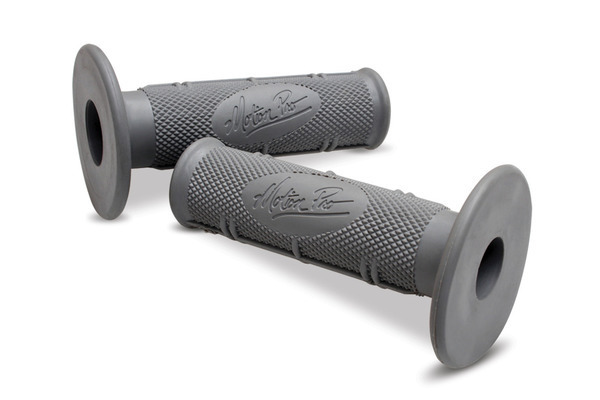 The included cam reel has a progressive profile that allows the throttle to act like a sensitive, long twist throttle during the initial small throttle openings for precise control and then acts like a more aggressive short twist throttle at large throttle openings, progressively shortening the amount of twist needed to reach full throttle. Also works great as general adhesive for anything that requires a flexible, waterproof bond that won't crack or become brittle. 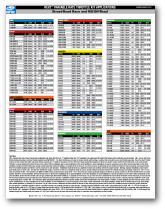 Lifetime limited crash warranty - If it breaks due to a crash or tip over we will send you a new one! 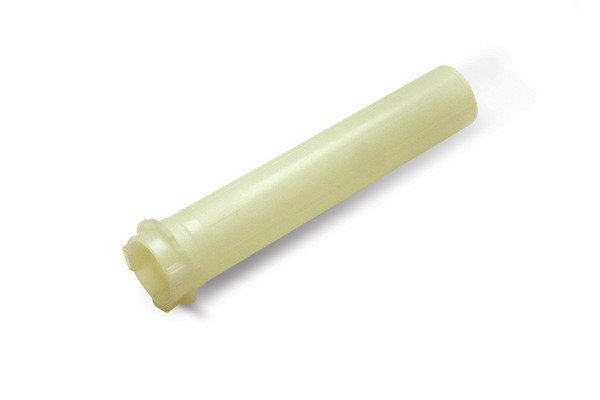 The Titan throttle tube has a non removable end cap. Modification of this product voids warranty. Progressive cam profile acts like a small diameter reel at low throttle openings, and a more aggressive large reel at openings beyond 40-50%. Sensitive control for small throttle openings for best feel, more aggressive at large openings for faster acceleration. 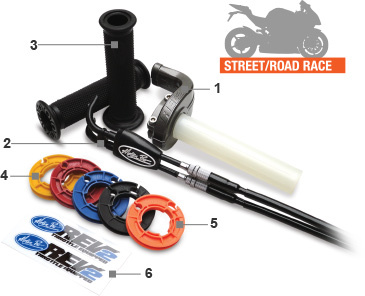 Included with every Rev2 Street Throttle Kit. Good for many conditions, including low traction mud or sand, where initial throttle opening is sensitive for good feel. Reduced on-throttle "hit" of powerful motocross bikes for better control, but maintains an aggressive throttle feel at larger openings. Included with every Rev2 Off Road Throttle Kit. Use "Search by Vehicle" above for the most up-to-date application listings. 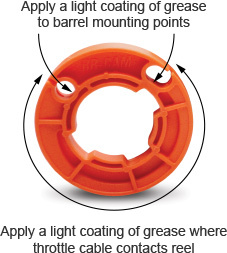 Download an application grease card for a handy quick reference. 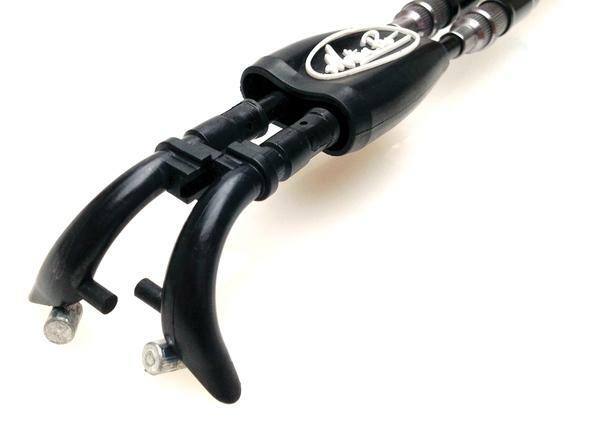 This product will allow you to set the amount of throttle twist to suit your style and riding conditions. 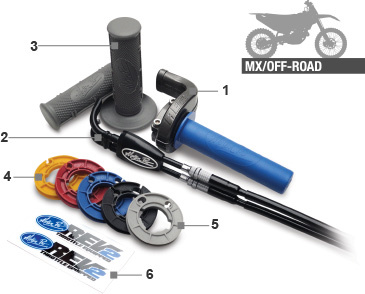 This throttle kit is meant for off-road and closed course track use ONLY. This kit should only be installed by a professional mechanic and must be installed and maintained in accordance to these instructions to work properly. Warning: Incorrect installation or maintenance of this product could result in great bodily injury or death. Always refer to a factory service manual in conjunction with these instructions when installing or maintaining this throttle assembly. 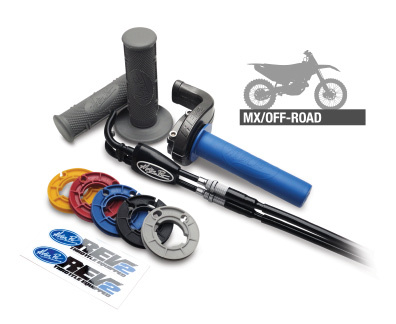 Rev2™ throttle assembly with throttle tube (MX/Off-Road kits include Titan™ Throttle Tube). 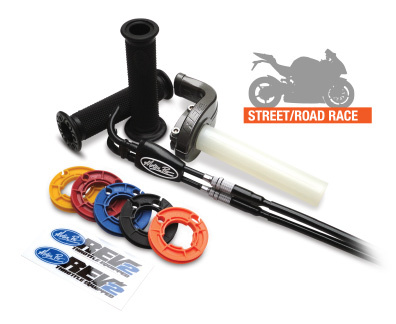 Decal set "Rev2 Throttle Equipped"
The throttle consists of a two piece throttle housing, the tube and five included throttle reels (straight rate 35 mm, 40 mm, 45 mm, 50 mm and a progressive cam profile). The throttle reels are designed so that they will only fit in one direction on the throttle tube and the throttle tube has a locating ring to position it in the throttle housing. 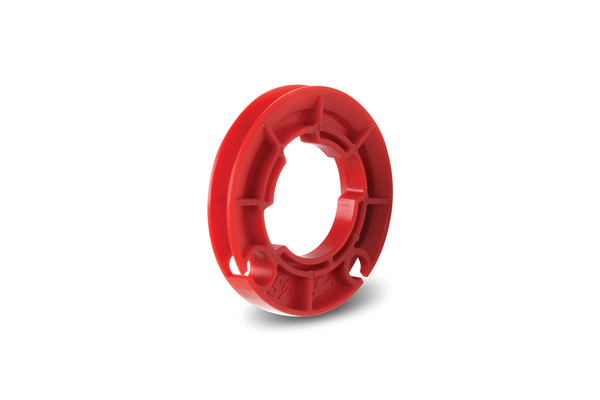 The throttle housing has a stop built into the recess for the throttle tube locating ring. Always make sure the throttle is properly assembled when installing it. If the components don't fit easily together, something is in the wrong position. Never mix the components of this kit with any other throttles or cables. This kit is a standalone assembly and any other componentsfrom any other assembly can cause the throttle not to operate or possibly stick or drag, resulting in possible injury or death. 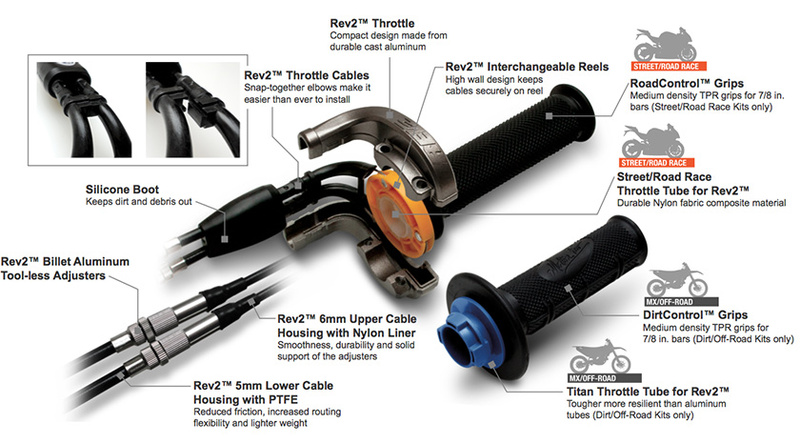 Replacement Rev2™ throttle parts and Rev2™ cables are available through your local dealer or Motion Pro. 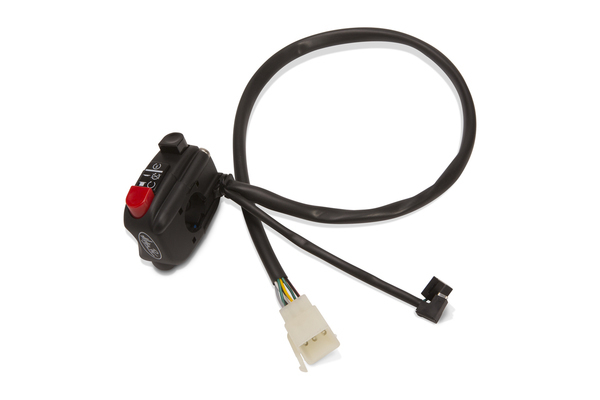 Some motorcycles have the engine kill and starter switches built into the throttlehousing. 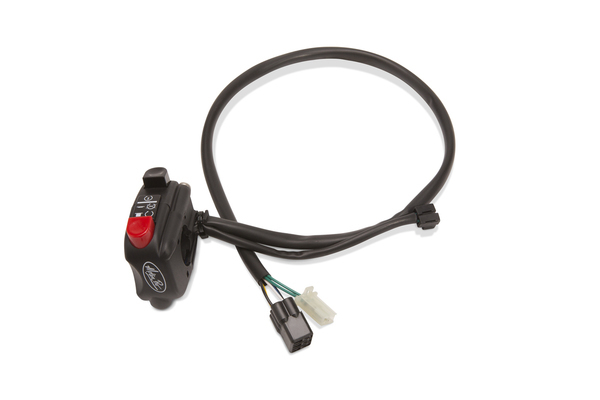 If this is the case with your motorcycle, you will need to purchase the accessory handlebar switch part # 11-0098 to replace the stock switch assembly. The replacement switch is not included in this kit. 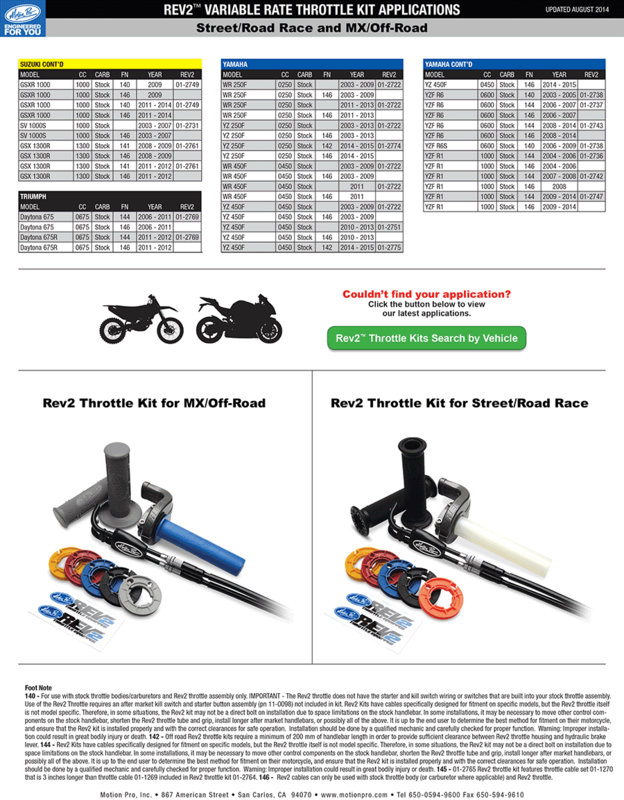 The Rev2™ throttle has several different size reels that will change how much twist is necessary for the throttle to completely open the carbs or throttle bodies on a motorcycle.The larger the reel is, the shorter the twist. Each reel size will shorten the twist by about 10 degrees. 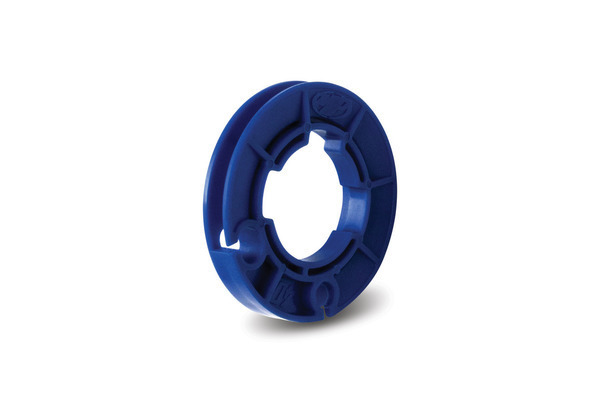 If your stock throttle has a 40mm reel and stock twist is 90 degrees (1/4 turn), the 45mm reel will reduce the twist to 80 degrees and the 50mm reel will reduce it to 70 degrees. 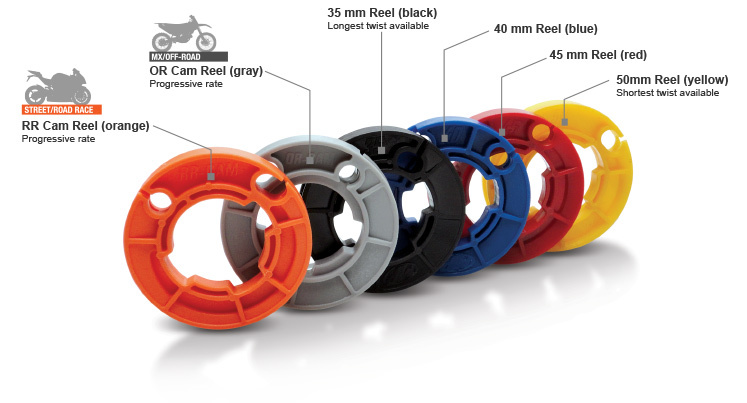 The 35mm reel will increase the throttle twist to approximately 100 degrees.This is just an example; every model of motorcycle is different.The included cam reel has a progressive profile that allows the throttle to act like a sensitive, long twist throttle during the initial small throttle openings for precise control and then acts like a more aggressive short twist throttle at large throttle openings, progressively shortening the amount of twist needed to reach full throttle. Use Search by Vehicle above to view your stock reel curve vs. the Rev2 reels. 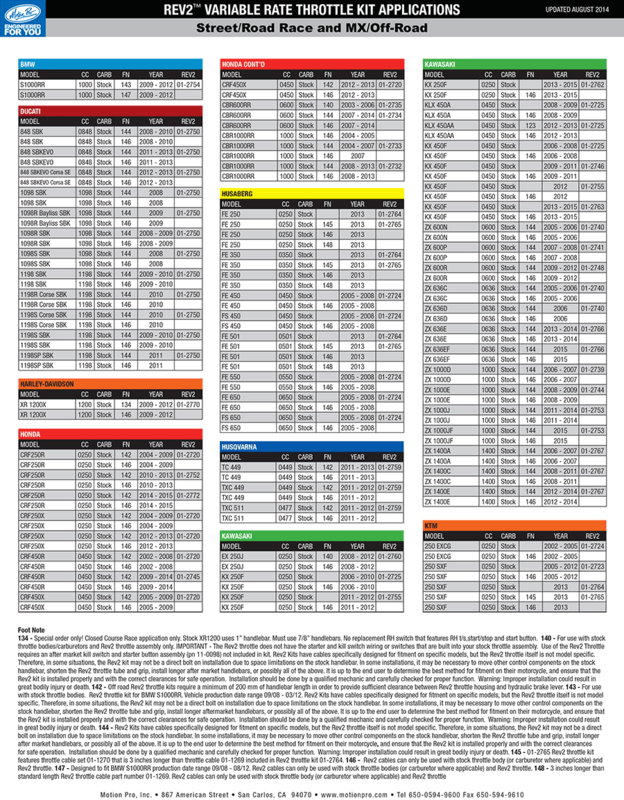 Consult your factory service manualfor disassemblyprocedures for your particular motorcycle. On most motorcycles, it will be necessary to removethe seat, gas tank and airbox to access the throttle cables on the carbs or the throttle bodies. Some bikes will require additional disassembly. Once you are able to access the cables on the carbs or the throttle bodies, remove the bar end on the throttle side (if there is one), disassemble the throttle housing on the handlebar and remove the housing, the stock throttle tube and the cables. 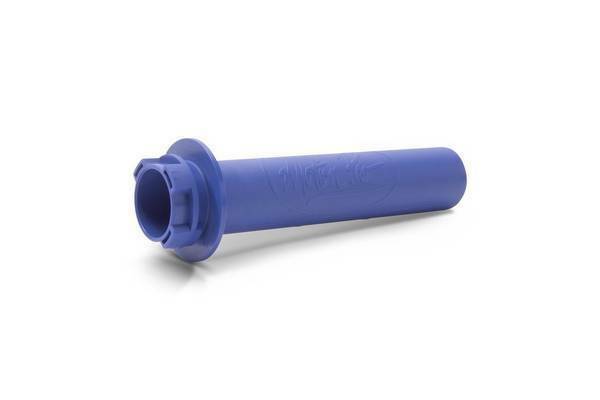 Keep the stock throttle tube handy for use later in the installation. Make note of how the stock throttle cables are routed and then remove the stock cables from the carbs or throttle bodies. 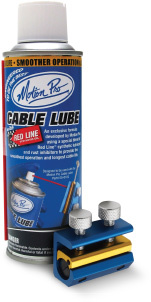 Before installing the new cables, first lubricate the cables using a cable luber (Motion ProP/N 08-0182) and high quality cable lube (Motion Pro P/N 15-0002). The cables are not lubed at the factory, so this is animportant step for best feel and cable life. 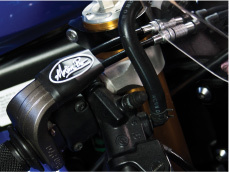 Install the Rev2™ cables using the same routing as stock and connect them to the carbs or throttle bodies. Make surethat the pull cable is attached to the pull side of the throttle bodies or carbs and thereturn cable to thereturn side. If you reverse them, the throttle will operate backwards. Do not tighten the adjusters all the way on the cable mounts at this time. 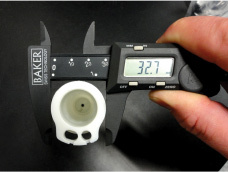 Measure the diameter of the stock reel (refer to the illustration for the proper method to measure the diameter of the reel on your stock tube). 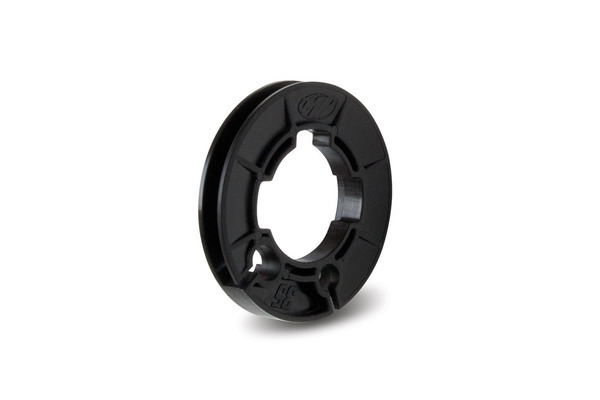 Then selecta Rev2™ reel from the kit that is closest in size to your stock reel, a largerdiameter if you wantto have a faster turning throttle, or a little smallerdiameter if you would like a slightly slower turning throttle and install it on the Rev2™ throttle tube. WARNING: Always select the closest size first. NEVER install the largest reel right away. 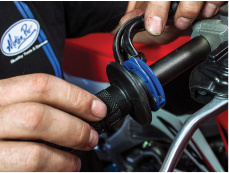 Making a major change in how your throttle operates could result in loss of control of your bike and serious injury or death. Always work one size at a time and ride the bike long enough to get used to how the throttle operates before making another change. 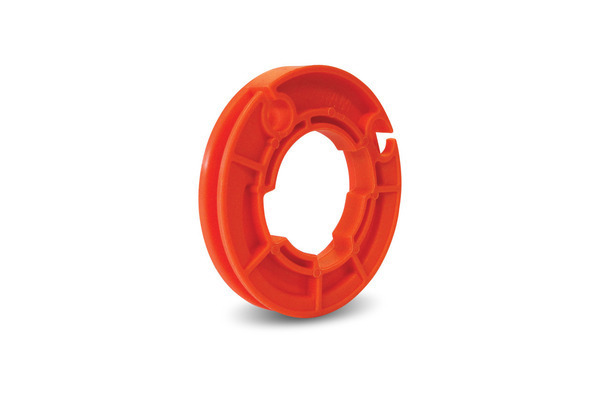 Make sure the Rev2™ tube flange fits inside the recess on the Rev2™ reel. 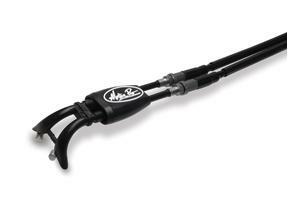 Install the throttle tube on the handlebar. 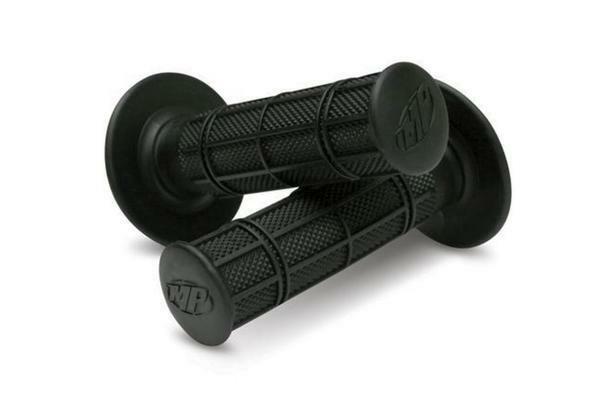 Use some high quality grease on the barrels of the Rev2™ cables and fit the push and pull cables into the Rev2™ reel. The cable wires will wrap around thereel and attach to the reel on the opposite side from the cable elbows. 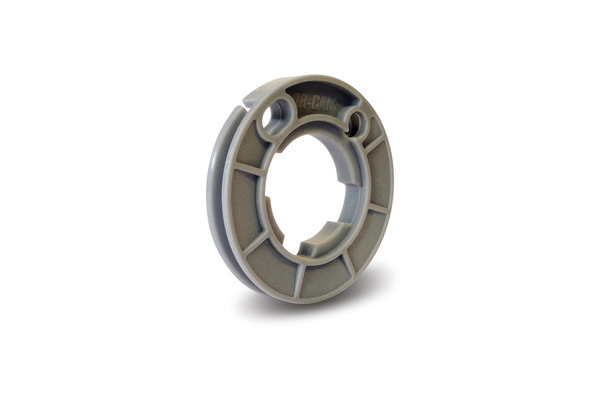 The pull cable barrel hole will fit very closely to the barrel, while the return barrel hole in the reel is slightly oval. 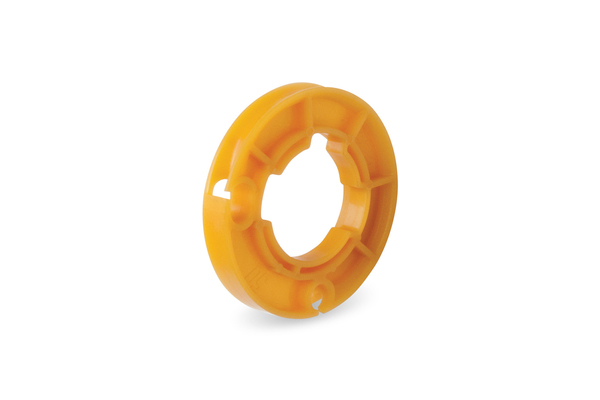 Use a small amount of grease on the outside diameter of the reel as well, where the cable wires ride. Install the two halves of the throttle housing around the throttle tube, reel and cable elbows. The housing halves should fit snugly together and the throttle should operate smoothly. If not, double-check to make sure the elbows are snapped together and alignedcorrectly and that the wires are routed properly on the outside of the reel. Once everything is fit correctly, install the two housing screws and tighten them evenly to clamp the housing on the handlebar. 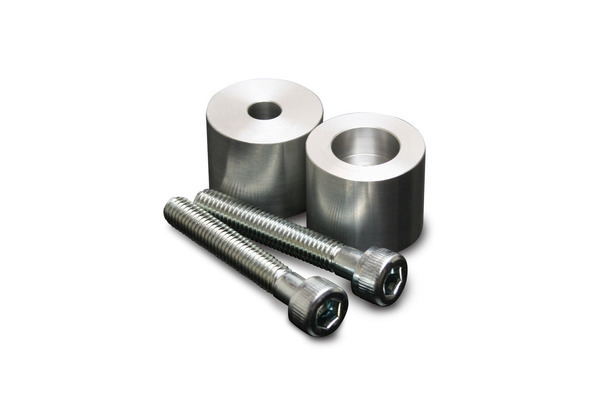 Do not exceed 90 kg/cm torque (78 lb/in or 6 lb/ft) on the housingscrews. At this time, the cables will still be slightly loose, but the throttle should operate smoothly and snap back quickly to the closed position. The aluminum inline adjusters on the cable housing near the throttle should be closed all the way before starting this step. 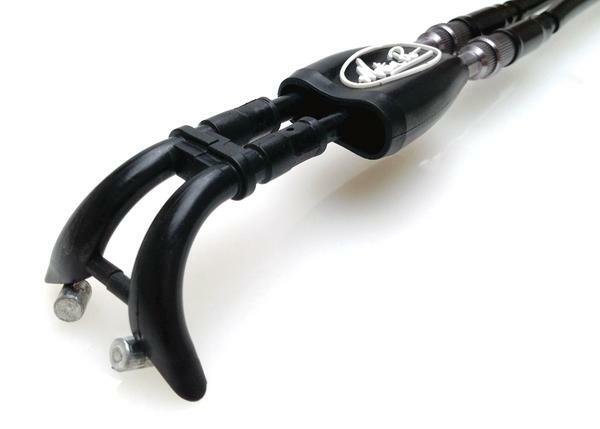 Some motorcycles have threaded adjusters on the throttlebody or carb cable mounts. If so, this is where you will start. 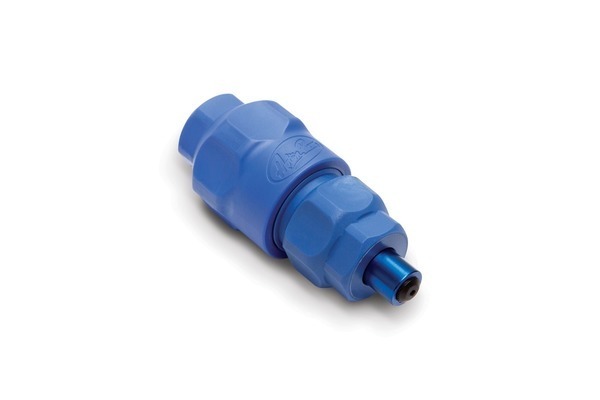 If there are only slip-on fittings at the carb or throttle bodies, the adjustments will be made at the inline adjustersonly. 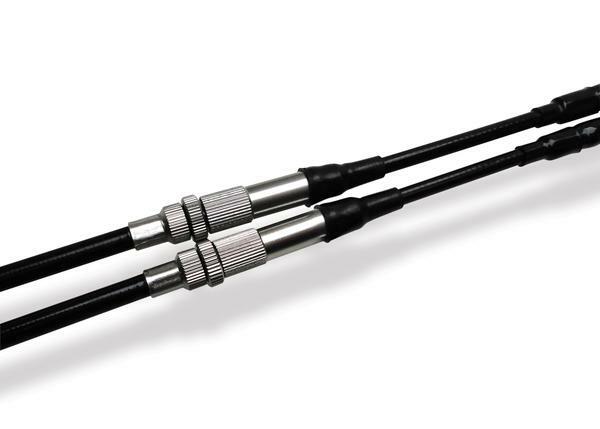 Start with the pull cable and adjust the adjuster until there is approxi- mately 1-2mm of free play in the cable. The throttle should be able to rotate a few degrees before startingto open the carbs or throttle bodies. Once this adjustment is complete, twist the throttle andlet go several times. The throttle should snap back closed very quickly. If it does not, double check all of your previous work to determine the problem. DO NOT continue until the throttle snapsback quickly on its own once released. Adjust the return cable after the pull cable is adjusted. The return cable should have 2-3mm of freeplay. If you are able to access the exposed wire of the return cable at the carbs orthrottle bodies, you should be able to deflect it fromstraight by a millimeter or so if it is adjusted properly. Open the throttle and release again and it should snap back as quickly asbefore. If not, the return cable is too tight. Adjust and operate the throttle again, until it snaps back quickly. 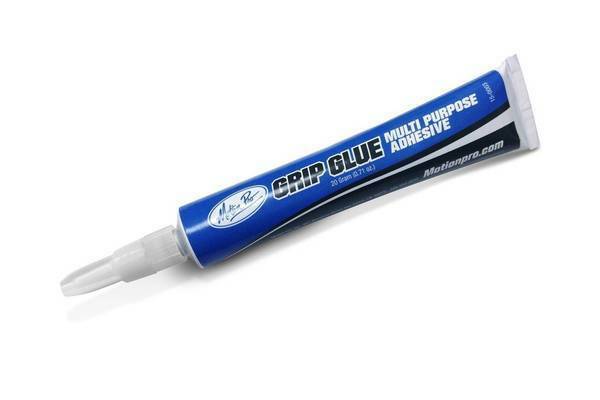 Install grips using grip glue. 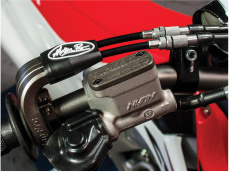 Make sure that the throttle side grip does not contact the throttle housing, which will cause drag. 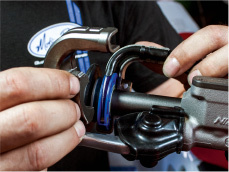 Reinstall any barends that may have been on the handlebars and test the throttle again to make sure the grip does not drag on the bar end and the throttle still snaps back quickly. Reassemble the airbox, gas tank, seat and anything else that was removed when you started. 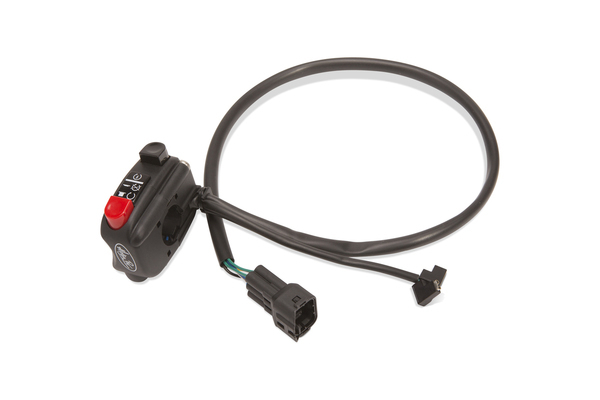 Make sure to make all the proper hose andelectrical connections, while referring to the factory service manual for details. With the bike on its side stand, or a paddock stand turn the bars all the way left and all the way right. While doing this, check that the cablesare not pulled too tight and that they are routed properly. Check the throttle operation at full left and then again at full right to make sure thatit does not drag and that there is some free play. Without turning the throttle, start the motorcycle. It should start and idle normally. If the idle is very high, something was not adjusted properly or was not assembled correctly. Turn off the motorcycle and recheck your work.If the idle is normal, turn the handlebars from full left to full right with the engine running. The idle should not change. If the idle rises when the bars are turned, there is not enough free play in the cables. Readjust the cables to allow more free play and repeat until the idleis steady no matter where the bars are turned. Then twist the throttle to raise the engine speed above idle and release the throttle. The engine should return quickly to a normal idle. 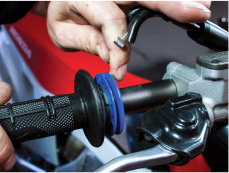 After installation of the Revolver throttle and any switches on the handlebar, test the brakelever to make sure that it has adequate travel without contacting the throttle or switch housing. 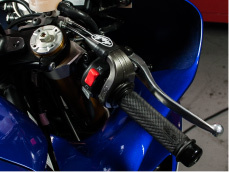 Some motorcycles have adjustable span brake levers, that when set at the closest position to accommodate someone with small hands may contact the throttle or switch housing before full brake pressure is applied. If this is the case, move or rotate the throttle and/ or switch housing concerned to provide proper clearance. When testing the motorcycle for the first time, pay close attention to brake function to make sure they are 100% functional. Ifthere is a problem, do not operate the motorcycle further until proper brake lever clearance is obtained. WARNING: Failure to install this kit properly could cause great bodily injury or death. The best place for a test ride is at a closed course racetrack. Make sure to ride the bike for sufficient time at low speeds and under no more than moderate acceleration to get a good feel for the different throttle response before going back to normal use of your motorcycle. 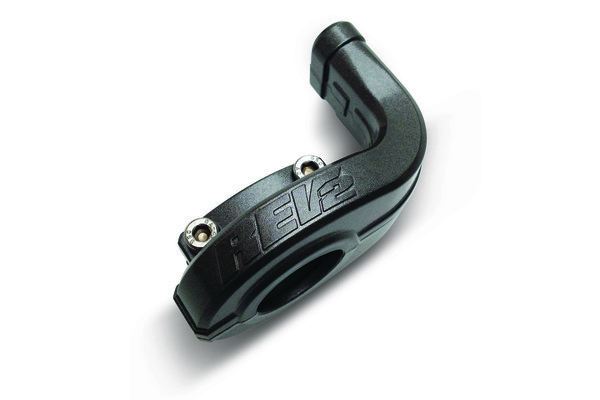 The Rev2™ throttle is designed so that you can easily change reels of the throttle to adapt to different riding situations. 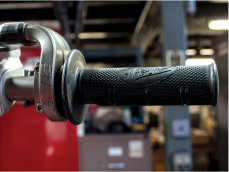 A fast turning throttle can be used for high-speed tracks and a slower turning throttle for more technical riding where greater control of the throttle is necessary.To change reels, all that is necessary is to remove the throttle housing, unhook the cables from the throttle reel and remove the reel from the tube and replace it with the size desired. Assembly is the reverse. A slight cable adjustment might be necessary (see step 4). 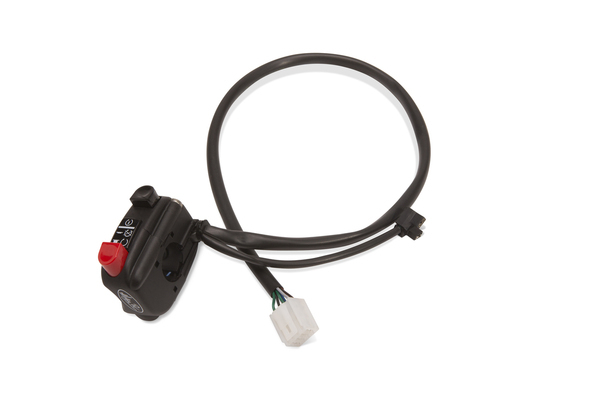 There is not much to maintaining the Rev2™ throttle, but like all of your controls, it will benefit from regular preventative maintenance. Before each ride, you should do a quick cable check to make sure cable slack is correct and the throttlealways snaps back quickly. 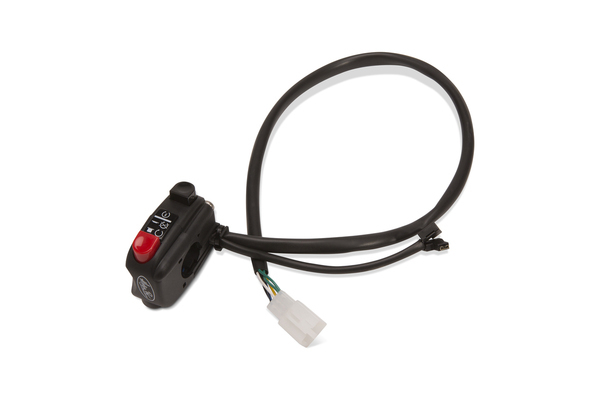 Once or twice a year, the throttle should be disassembled, cleaned and lubricated, including lubricating the cables. 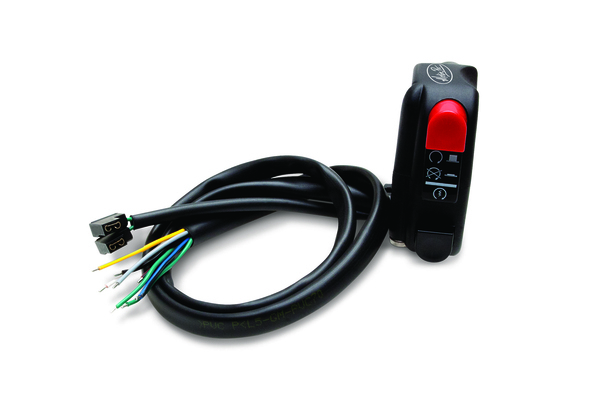 Give the cables and throttle a visual inspection for any wear, cracks or other signs of wear ordamage. Always immediately replace any component that is worn. 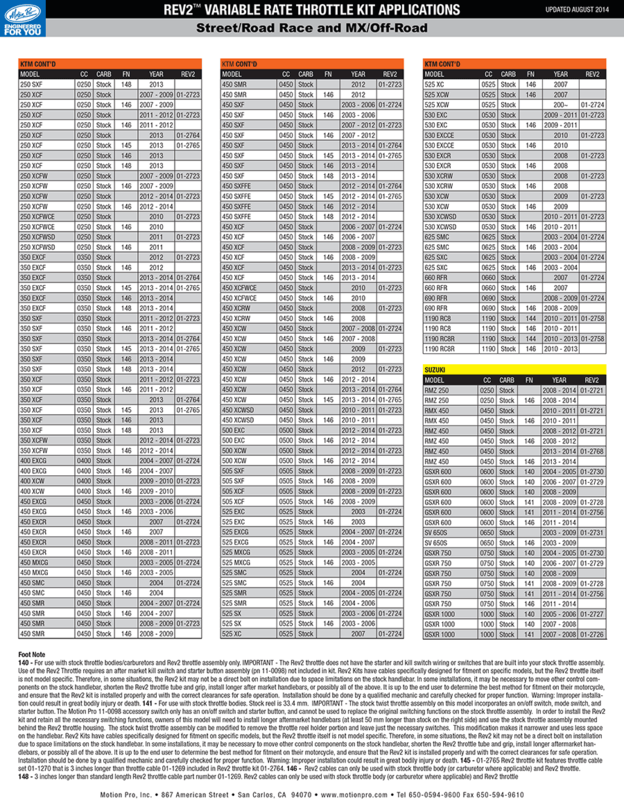 Motion Pro Warranty Department at 650-594-9600 to get an RGA number before returning product.